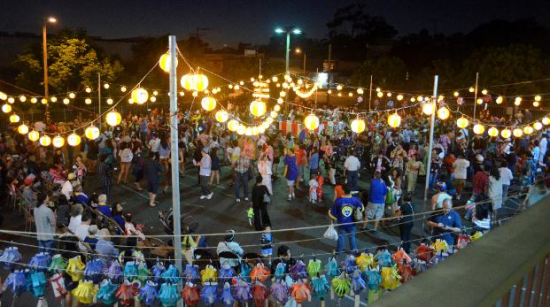 SAN DIEGO — Buddhist Temple of San Diego’s Bon Odori/Gathering of Joy will be held Saturday, Aug. 3, from 4 to 9 p.m. 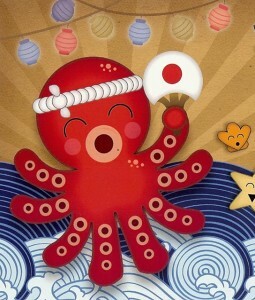 The event will feature traditional Japanese dancing; performances by Naruwan Taiko San Diego Taiko and BTSD Taiko; food; cultural displays; activities for kids; and the “Obon Again” Store. The Japanese American Historical Society of San Diego will present a display about Issei women and sell copies of “Journey of Heroes,” Stacey Hayashi’s new manga about the 100th Infantry Battalion/442nd Regimental Combat Team. Free and open to the public, the festival is starting an hour earlier this year to allow ample time to eat dinner or a snack, shop, and enjoy the exhibits and performances before the dancing begins at 6:30 p.m.
“Everyone is invited to join us for this year’s Bon Odori as we joyfully celebrate and remember the lives of family members, friends and temple members who have passed before us, and reflect on the teachings of the Buddha,” a temple spokesperson said. The final dance practice will be held Wednesday, July 31, from 7 to 9 p.m. in the temple annex hall. BTSD is located at 2929 Market St. (Freeway 94 at 30th Street) in San Diego. For more information, call (619) 239-0896, email [email protected], or visit www.btsd.net or https://www.facebook.com/buddhisttempleofsandiego. Parking is available at the ARC of San Diego, just east of the corner of 30th and Market.